Duncan Luke is now head of B.I.G. 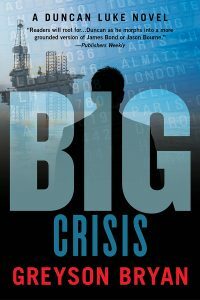 but his life is chaos: his ex-wife bars him from their son; Bingham loses critical investors and danger lies in a corrupt oil deal. London, Paris and a West African island nation are keys to solving CRISIS as Duncan sets out around the globe and a future with his autistic son, Sam, hangs in the balance. PW says, “Readers will root for the sympathetic Duncan as he morphs into a more grounded version of James Bond or Jason Bourne.” Readers say, “If you love authors like Michael Connelly, you will definitely like Greyson Bryan and. . . his five star worthy BIG series. FREE through 4/4. Greyson Bryan is an international lawyer with a B.A. from Stanford and a J.D. from Harvard who is an expert in the field of international business intelligence. Grey taught at the Harvard Law School and UCLA. A longtime L.A. resident, Ending BIG is the 3rd book in the BIG series.